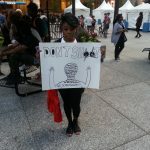 On April 28, hundreds gathered outside Chicago Police Department headquarters, at 35th and Michigan, to show love and respect for Rekia Boyd, Freddie Gray, Michael Brown, and all the others whose Black lives matter. The crowd was largely young and multicultural. What is the truth about Freddie Gray’s death? The truth is that he was murdered by the notoriously racist and brutal Baltimore Police. Baltimore has exploded in anger because of the attempt to obscure this obvious fact, to pretend that the basic life experience of Black people over the last five decades, if not the entirety of U.S. history, can be dissolved into a social mystery. This generation serves notice: that shell game is over. On March 19 hundreds of workers from the BP oil refinery in Whiting, Ind., massed in front of BP corporate offices in Chicago. The 1,100 workers’ strike has continued over unfair labor practices. The local issues centered on safety and staffing after BP rejected the pattern agreement of the industry with the United Steel Workers. In Chicago, thousands march for a living wage, while in Los Angeles, protesters of all races marched downtown on the anniversary of Martin Luther King’s 1968 assassination. They included low-wage workers campaigning to raise the minimum wage to $15 an hour, uniting with the movement against police killing of unarmed Black and Brown youth. Election Day in Chicago, Feb. 24, made the historic nine-day Chicago Teachers Union strike in 2012 a pivotal issue again as the candidate supported by the CTU forced Mayor Rahm Emanuel into a runoff. 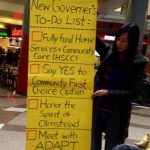 Illinois Governor Rauner has made his living out of exploiting the disabled and elderly in his many nursing homes. Thousands in Chicago: From NY to Ferguson, stop killer cops! Thousands of people packed into Daley Plaza on Aug. 14 for the National Moment of Silence. Observed in 90 cities, it was called to respond to the police killing of Michael Brown, an 18-year-old African American, in Ferguson, Mo. Chicago ADAPT, along with Community Alliance and Northside Action For Justice, held an action at the offices of the Department of Human Services, which also houses the office of the Department of Rehabilitation Services because of the conflicting and confusing information we were getting from the state heads of human services versus the various DRS offices throughout Illinois. 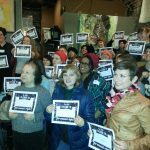 Report on a rally in Chicago for Equal Pay Day. 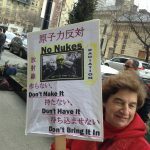 Demonstrators gathered in front of the Japanese Consulate in Chicago on the third anniversary of the first meltdown at the Daiichi nuclear plant at Fukushima. The purpose of the protest was to shine a spotlight on the continuing crisis: that radiation continues to be released into the water and into the air, despite the efforts of workers who at risk of life and health are quickly acquiring lifetime doses of radiation. Cops beat deaf man in Hawthorne, Calif.; Assad’s forces torment man with Down Syndrome in Syria; South Carolina abuses mentally ill prisoners; disabled Chicago woman illegally evicted. Close to 2,000 people rallied in Chicago against the American Legislative Exchange Council (ALEC). Dozens of people gathered outside a resale store in Chicago to demonstrate against Goodwill Industries’ hiring disabled workers at steeply sub-minimum wages. 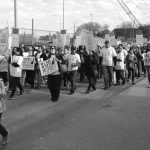 Walmart store and warehouse workers, with the support of several busloads of national NOW conference participants, rallied at the downtown Chicago Walmart store. On April 9 rallies were held across the U.S. to mark the day women’s earnings catch up to what men’s were at the end of 2012. Supporters celebrate outside the court. Photo by Franklin Dmitryev for News & Letters. Chicago—Anyone who has lived through a homeless winter on the streets of a Midwestern city knows the value of a warm night. It means you die a little less. Maybe get to stay out of a shelter, or avoid the humiliation of the Mission. Maybe talk with a friend in peace. Chicago—Dozens of people marched on Chicago’s South Side to take a stand against violence on Jan. 15, followed by a speakout and vigil. Occupy the Southside organized this “King on King march” down Martin Luther King Jr. Drive from 63rd to Emmett Till Road. Chicago—About 30% of homeless youth in the U.S. are Queer. Many become homeless after being thrown out of their homes by families who reject them. And Queer youth are outing themselves at younger ages. Chicago—Twenty-four Black men are still in jail almost 40 years after the first allegations of torture were brought against the Chicago Police Department. In every case, their confessions were obtained illegally through torture. Chicago–The Illinois Department of Healthcare and Family Services on May 1 implemented a five-year pilot program and the state’s first Integrated Care Program for older adults and adults with disabilities eligible for Medicaid but not Medicare.